Any DXpedition begins with a fantasy. 'Wouldn't it be nice to go to...' One evening in May 1992, sitting in the Arizona home of Frank Smith AA7FM, and his Finnish wife Kirsti, we began talking about how nice it would be to do a joint trip and operation from Malyj Vysotskyj (MV) Island. We, Romeo Stepanenko 3W3RR, Andy Chesnokov UA3AB, Frank and myself, were certain in our desire to go ahead and do this operation, much like the first operation from MV Island. Knowing that one must define a DXpedition in greatest detail before it will take shape, we begun to realize what those details included, such as how to obtain permissions, who all the other players would be, where and when we would meet, etc. As we parted for the evening, it was decided that Frank would contact the Finnish authorities (Frank is the Consul of Finland to the State of Arizona) and locate the OH-operators to go to the island with us. Romeo and Andy were to take care of the licenses and permits and arrange transportation to the island. I would act as a coordinator for everyone, tieing everyone and everything together. The trip was set to take place in October 1992. In order to be admitted into the Samaa Canal zone where MV Island is located, permission must be secured from the Russian and Finnish members of the Saimaa Canal Commission, an administrative body that governs the use of this waterway and the MV Island. The Russian side of this body is headquartered in Moscow and the Finnish side is in Lappeenranta, Finland. For us to get licensed, we first had to receive the paperwork from the Russian side stating they wouldn't object to the group's operation on MV Island. This paperwork would be issued only after the Finnish side of the Commission gives its own OK. For the Finns to give us the 'go ahead' we needed to present them with definite dates of the trip and the exact list of participants. In addition there would be visas to enter Russia and for the Finns a special entrance permit to the canal area. Frank immediately got to work and many phone calls and faxes traversed to Finland to locate and recruit operators. Martti OH2BH offered to locate Finnish operators for our group. 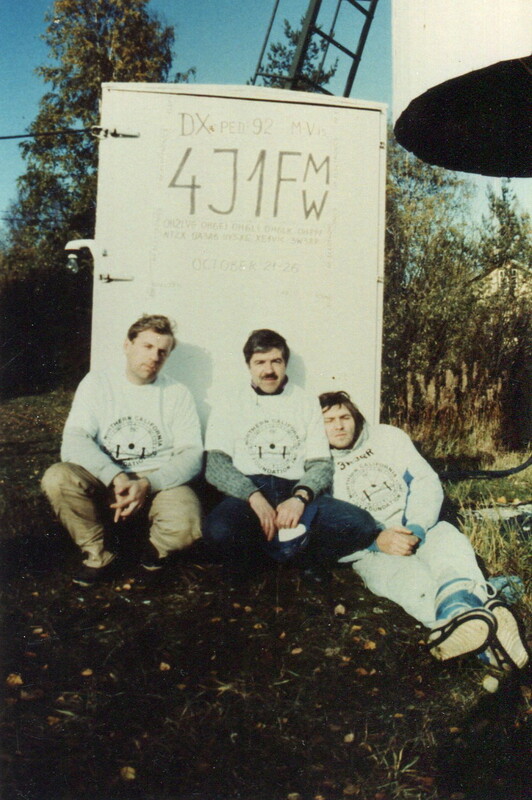 After going back and forth, talking to the Finns and the Russians (and there were several other Russian candidates too), by September we had a team consisting of: Jukka OH8PF, Kari OH6LK, Tomi OH6EI (Contest Manager of the Finnish Amateur Radio League), Jukka OH6LI, Frank AA7FM, Victor XE1VIC of Revilla Gigedo fame, Romeo 3W3RR, Andy UA3AB and myself, Ed NT2X. By the time the trip commenced George UY5XE joined up making our group, technically, Russian-Finnish-American-Mexican-Ukranian-Vietnamese (!) DXpedition. In the meantime, Andy in Moscow issued invitations to all the participants to come to Russia, such invitations being required for the visa applications. They were released October 7, barely two weeks before the operation. Applying for my visa in the newly-opened Russian consulate in New York was a sinch - I had my visa a week later. (Frank got his from San Francisco in just 22 hours: consul-to-consul service, evidently!). Getting airline tickets for the date I wanted was trickier – Finnair, the obvious choice, had no seats left, and none were available on other airlines for a flight to St. Petersburg, so I had to leave a day prior to schedule. Preparations for the trip were elaborate: Frank and I came up with a list of items needed for a trip. The list consisted of 57 entries (and is now available for an SASE to anyone who may need it for a similar trip to a very cold QTH). It took us some time to figure out who was bringing what, but Frank ended up carrying an A3S tribander, a spare TS-930S and a Yaesu FT-850. I got to carry a 'Battle Creek Special' – a multiband vertical for 160/80/40. I also took over an antenna tuner, keyer and paddle, a handycam (I was designated an 'official' DXpedition videographer), assorted connectors and wires, and the all-important NCDXF T-shirts. Chuck K8CH kindly provided us a sunrise/sunset table for MV Island. We determined it would be impractical to carry food over from the USA, so we ended up taking Victor to a Finnish supermarket to make the gourmet selections. Imagine Mexican DXer purchasing Finnish foodstuffs for preparation in Russia for hungry Americans. We were beginning to appreciate how truly international in scope our operation was. We couldn't have made it without the Finns. Jukka OH8PF welded two crank-up towers for us, secured another tribander, rotators, a 10-meter monobander, assorted dipoles, three generators, fuel, water, and many other small and large items. The Russians provided two other stations and took care of the boat transportation and other arrangements for us 'foreigners'. We all brought our own arctic quality sleeping bags – each one of which would take valuable luggage space. Before Frank departed for Finland, I gave him one word of wisdom: 'Frank, we planned everything well. But Russia, as you know, is unlike any other country. Things would get screwed up, somehow. Please keep your cool and don't throw in the towel, because everything would be fine at the end'. This is how Russia works... Nothing is ever simple there. Frank said he understood: he had traveled extensively throughout the Old Soviet Union many times in the past years, including in fact, the same area we were now headed to. I enjoyed a nice flight on Finnair to St. Petersburg on October 21, with a stopover in Helsinki. Miika OH2BAD came over to say 'hello'. While wandering around Helsinki's modern airport, I was somehow reminded of a long-ago drawn conclusion: when I go to Russia I always feel like leaving my 'Western civilization footwear' at the door, and tread lightly. Just to reinforce my own conviction, there at Vantaa Airport (Helsinki) I heard an American preacher giving-last minute instructions to a group of followers about to embark on a religious trip to Russia. He was warning them to expect their first impression to resemble that of America, circa 1930. I didn't like flying into St. Petersburg... It took forever to process passengers, customs were slow and there were no luggage carts anywhere. I had to trudge heavy luggage to a line leading to an x-ray machine. Just in front of me an American businessman had to open his suitcase and suffer the humiliation of a customs official scrutinizing the contents and who then took two items, putting them into his own uniform's pocket, all in broad daylight. I could see Romeo, Andy, George, Jacob UA1FA and Mike UA1AFM/RW1AI in the distance. When the same customs official didn't like my HT and wanted to detain it, despite the permit I had, Andy came forward and persuaded the officer to let me proceed. Later that day, he wound up going to the local office of Russian Communications Ministry, brought another permit just for my HT and got it back. I had to pay $20 for storage. Just imagine, four hours of storage for a tiny HT and no receipt! Welcome to Russia! In spite of all that, I considered myself extremely lucky, if it hasn't been for my Russian friends, I would have probably lost time and equipment trying to resolve the situation myself. That night we left St. Petersburg by taxi to Vyborg, a trip that would take us about 100 miles even further north. Our cabbie spent an hour circling the city looking for an open gas station to fill-up both his car and a spare container. Otherwise he wouldn't have been able to return home from Vyborg. A long run and not a chance of finding a gas station faced us. Only on the road frequented by tourists and in the middle of nowhere we finally stumbled upon a gasoline station. We paid with roubles, not some coupons which were in use everywhere else. We then took off with death-defying speed for a couple of hours along the icy road without the help lights or reflective road-markers. White snow bordering black asphalt identified our road margins. We arrived in Vyborg sometime after 1 am, wondering where we would stay. Well, there was 'Druzhba' (Friendship) multi-star hotel, build by the Finns in the 70's for Finnish tourists. At $80 per person per night (32,000 roubles, a semi-annual salary in contemporary Russia) it was hardly a bargain. The only other alternative was 'Vyborgskaya' hotel, for the Russians. It was 140 roubles per person per night ($.35) if you were Russian, and 650 roubles ($1.63) - if you came from one of the Baltic countries. Talk about discrimination! No mention of other foreigners, apparently they avoided the place. Another permanently affixed sign we noted claimed 'No Vacancies'. Of course there were vacancies, if you know how to talk to hotel receptionist. Considering Romeo's diplomatic successes in dangerous Afghanistan and Burma, we let him do the talking. The hotel's automatic elevator was shut down for the night, so we were forced to carry heavy bags all the way up to the sixth floor using the stairwell. We got a three-bed room for four people, a working TV with 2 channels (one of them was MTV, even in this rat hole), a telephone – for local calls only, which requires 15 tries before it works and a bathroom with a broken shower, falling tiles and a half-functioning toilet. We were fairing great! Besides, who said you have to always stay at Hilton? Of course, restaurants were all closed or non-existent, so our supper that night consisted only of some smoked franks, beer and M&M's Frank told me to bring from the USA. George cut the sausage with a knife handcrafted in Chernobyl where he volunteered for clean-up after the catastrophe. My guys just wouldn't get up in the morning. Fortunately, I was still functioning on New York time and woke them up. Besides, Finns must have been waiting already! Andy and George left to secure permits from the local border patrol post for all of us to enter the frontier area. But it turned out foreigners don't need one, and the border guards already knew about us as it was. Romeo and myself stayed behind, watching our belongings - we didn't need any surprises. After completing all the formalities, Andy and George returned a few hours later. Then they now had to hitch a truck and drive to the border meet Frank, Victor and the Finnish team. There are no rental places in Vyborg, so you must flag down anyone, offer them money and hope they would agree to run your 'errand'. They indeed found a truck, rode to the border post #2 (which was 25 km south of the real border), only to find out that the Finns were already turned away by the guards at post #1. Panic set in. It turned out that the Russian consulates in Helsinki, San Francisco and Mexico City all forgot to notate in their own visa forms permission for the guys to take the vehicles into Russia. It would have been OK if they had come by hot-air balloon or a Grand Canyon mule, but not by car, without this sacred rubber stamp! Indeed they were ordered back to Helsinki which would have delayed our entire operation by a day and a half as well as clearly jeopardized the entire DXpedition. And of course, Frank and his group were wondering how they would ever get word to us. We all tried by 2 meters, but were just too far apart. Because of bureaucracy, the special orders from Moscow to give the entourage unhindered passage were late by twenty minutes at the checkpoint. Finns were on their way to Lappeenranta, Finland, all but cancelling the operation. Everything was coming apart! After calling continuously on 2 meters Andy overheard a conversation between the group and John Ahlbom OH5NZ who coordinates all MV Island DXpeditions. From that conversation Andy picked up John's home telephone number. Andy and George flagged down a Finnish trucker who had a cellular telephone on board and dialed. Andy called John's number, but by that time John wasn't home... he was with Frank, standing outside his car near John's office. Andy did get hold of John's daughter at home, who in turn knew how to patch the landline to John's cellular phone. Just about to leave the vicinity of John's car, Frank and John heard the telephone ring. John lunged for the phone, thinking it was his wife. Seeing John's face light up with enthusiasm, Frank knew it was Andy on the telephone. Andy explained that the problem at the border had been solved and ordered the group back. They wasted no time re-assembling themselves and returning to Nuijamaa, where the Russian guards, all of them ex-KGB boys, saluted the 'missing tribe' through their post. They were obviously embarrassed and weren't interested even in friendly discussions. The Finnish group shared in this same lack of interest. They just sped through to the Border Post #2, where Andy already primed the customs officials, who couldn't be more friendly and cooperative... even taking orders from Frank, an American citizen. Unbelievable. Lady Luck was really merciful this time! We talked about the situation later and came to a conclusion that we should have used a random wire for antenna out the hotel window and talked to OH5NZ on 80 or 40 meters, continuously, throughout this 'border commotion'. There is nothing worse for a ham than being held incommunicado, in the country without telephones. While waiting for the team to arrive, Romeo and I took a little stroll around old Vyborg (Viipure in Finnish), the formerly Finnish town whose history goes back centuries. It was annexed from Finland by the Soviet Union in the 1930's, but even nowadays enjoys a distinctively Finnish flavor. Most of the streets were semi-empty since most of the hubub centers around the train station. Adolescents with crew cuts were seeking out foreigners trying to sell them souvenirs, vodka and who knows what else. Most buildings were built at the turn of the century. We were pleased to see a lot of renovation in this historical town. One of the most ambitious projects was a joint Russian-Finnish renovation of a building, dating back to 1908. We were told how city fathers seriously planned to open an excellent 'house of ill repute' there, to attract tourists. Oh, well, lately anything is possible in Russia. Food stores had bread, meat, milk, sausage, some vegetables, few people in lines and high prices. Most variety was at hard currency 'Beryozka' store – from French wines to smoked mussels. Finally at about 6pm, hours behind schedule, Kari OH6LK, picked us up at our hotel, then drove us to the harbor where the whole team met up at last. A large municipal passenger ferry, 'The Agat', makes regular trips between Vyborg and surrounding islands. It was at our disposal for a small fee. They were already loading ham radio gear onto its deck. We left our vehicles at the port and took off into a quickly blackening night. The uneventful trip was filled with toasts and more toasts to friendship, Amateur Radio and respective countries of the participants, the mood was festive, as if we were sailing into the Caribbean, on a fun cruise. Victor started to hand out colorful Aztec calendars to everyone, including the boat captain. The wind outside was, however, strong and bitter, and the air smelled of winter. Just as quickly as the journey began, it was over. The boat docked us into the middle of total, pitch-black darkness. The captain set his floodlight to the shoreline long enough for us to get our gear unloaded onto a couple of wooden docks. The only other source of light was a battery-driven maritime beacon atop white-colored cylindrical tower. The howling winter night embraced us, as if greeting us to MV Island. I felt like an astronaut walking on the Moon. Jukka OHSPF immediately started one of the generators and turned on a floodlight. Soon we could see two buildings which we proceeded to occupy, one would be our sleeping quarters, and the other - our operating site and banquet hall. Our last source of warmth and safety, the ferry, vanished into the darkness as soon as the last piece of luggage was off and we were left to our own devices. Before we gave any thought to food and accommodations, we worked feverously to set up the first station. An 80-meter dipole was strung as if by magic. Karl, Tomi and both Jukkas unpacked and assembled station equipment. The house was wired for electricity, so when a generator was plugged directly into the AC outlet we got ourselves electric power. Frank had the honor of a first contact, with OH3PK on 75 meters, in Finnish. 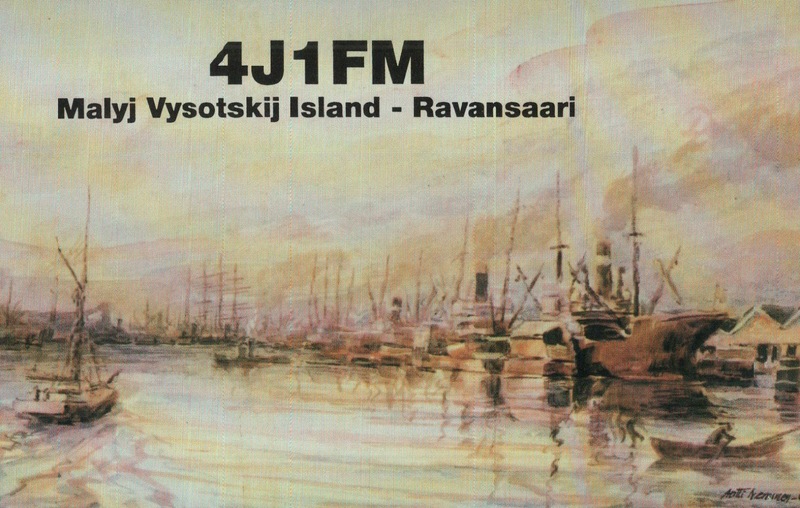 Suddenly, several other Finns were on line to score a contact with MV Island, a DXCC country you'd think they wouldn't need! As Victor, Andy and Romeo were getting the 160 meter dipole up, I was running around with camera, trying to commemorate everything on video. A few hours later we were all exhausted, but happy. All stations were now set up and operational. We decided to assemble the HF yagi in the morning and went to bed. Someone was to man the low bands at night, where pileups were already fierce. A good thing about Europe is that no matter how rare, or how common a callsign you have, you never ran out of stations to work. Everyone found something they were good at. Victor XE1VIC possessed some serious knowledge about hand openings and greatly helped with multipliers at contest time. Jukka OH8PF, Tomi and I (thanks to the Yankee Clipper Contest Club experience) planned contesting strategies. George was very good at climbing trees, solving technical problems and keeping scores throughout the contest. Romeo found time to cook hot meals for the whole crew, while Frank, Karl and Jukka OH6LI, assembled most of our HF antennas and towers. We all helped put antennas up and, of course, everyone got to operate. With ten operators and three stations, I wished we had more time per personto spend on the air. Still, it felt good to hear time and time again 'Thank you for a new country on this band!' or just 'Thanks for new one!' After all, that's what we were there for. We chose to spend more time on CW before the contest, where they could work us on SSB. Japanese pile-ups were particularly big, and so were American. We had rates up to 220 per hour. Being far up north (latitude of Anchorage, Alaska), we didn't get to work anyone on 75/80 from North America, despite the excellent 'Battle Creek' antenna. From time to time we would forget to add gasoline to the generators and they would stop. In the middle of the night the active crew would ran out with flashlights to do the refill. Bitter cold made us constantly yearn for hot food and drink. 'Authentic Finnish coffee', prepared by Tomi, was everyone's favorite, when consumed with condensed sweet milk we brought from Vyborg. Hot pea soup with Russian black bread never tasted better. Jukka OH8PF had a couple of hundred Finnish stations lined up on 7 5 meters to work us, and he zoomed through them with admirable speed. 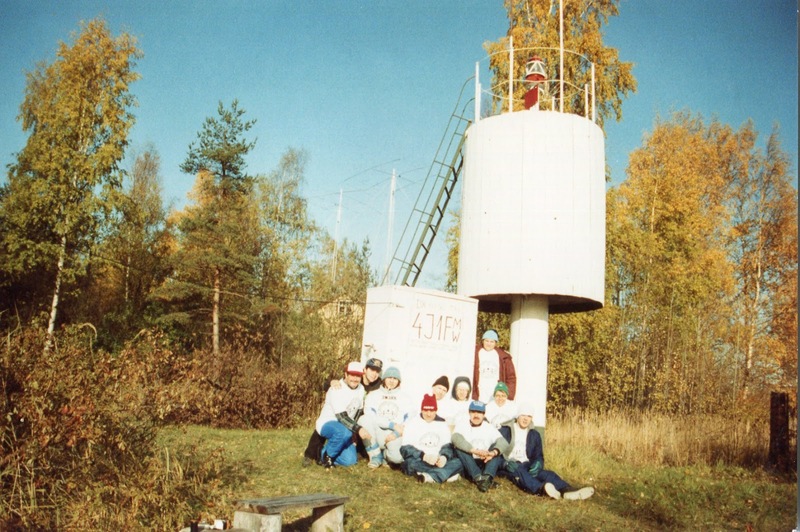 To be competitive, he climbed the tower and put up a 2-meter beam aimed at Lappeenranta, Finland. We were able to pick up contest DX announcements and stay in touch with Finnish operators who were concerned about our well-being. A total of about 13,000 QSOs were made, many on low bands and 28 MHz, where MV Island was still in demand. 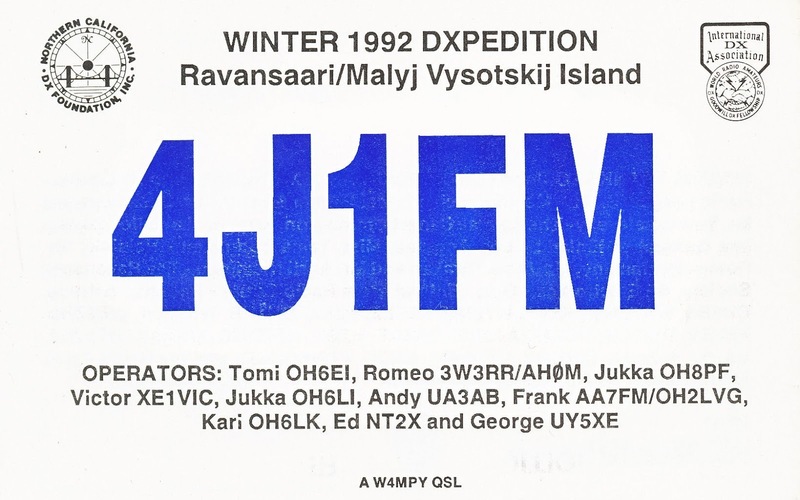 Considering this was the first ever wintertime DXpedition to MV Island, we felt quite proud of that number. I must to give tremendous credit to the Finnish operators, they came well prepared - obviously, living in Arctic climate have a lot to do with it! They brought every necessity, including an electric stove, a microwave oven and a heater. Furthermore, all were dressed in warm skiing overalls, unlike the rest of us. I was dressed in thermal pants, jeans, one pair of regular socks and two pairs of warm ones with hiking boots, a T-shirt, a warm sweatshirt and a thick sweater, 314-length winter coat, a cap, wore a pair of gloves with work gloves on top. Was I warm? Not really. 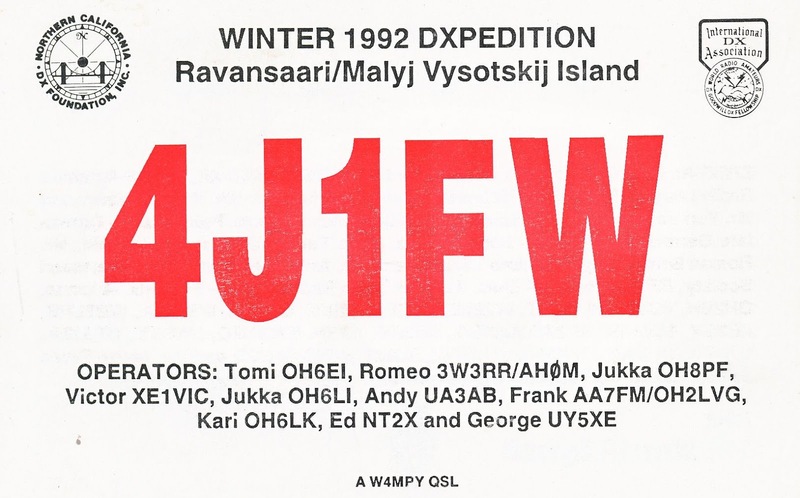 Winter DXpeditions are fun! We spent some time exploring the island. It is over a mile long and overgrown with trees and bushes. There have been many people who have lived on this island, including over 1 000 Finns in the 1930's and some Russians in the 50-60's. Right now all that remains are collapsed abandoned buildings, blown-up foundations and forest paths, that were once large main streets. We had been warned to watch for abandoned water wells and bunkers, which are plentiful. The Ravansaari Historical Society (Ravansaari Seura) of Helsinki has hand-crafted and installed street signs there, as a tribute to the once-ebullient life and people that lived here. From where we were, we could see neighboring islands with motor boats going back and forth, big cargo vessels passing through Saimaa Canal, even some serious-looking Navy ships docked in the nearby town of Vysotsk. Occasionally, a border patrol boat would go by the island, but displayed no apparent interest in our activities. We expected no local company, but one afternoon Romeo spotted a couple of strangers prowling in the bushes near our site. He convinced them it was in their best interest to leave and a few minutes later they were spotted hurrying away in a small boat towards Vysotsk. We were quite sensitive to this since one prior DXpedition lost several full gasoline cans to thieves in the night. So we moved most of our belongings into the 'radio building'. Our buildings were well maintained, and we were asked to leave them clean and intact. There once were bunk beds and a nice refrigerator there (all property of the Finnish government), but some locals apparently thought it was too much luxury for a small place. We proudly flew an INDEXA banner while on the island. Aside from being our sponsor, this international organization believes in goodwill through amateur radio. Its banner became our own statement of friendship and goodwill. We had the most fantastic time on MV Island, and five short days were hardly enough for us. Despite our diversity, we haven't had a single argument. Well, as they say: 'Real DXers are true gentlemen'! 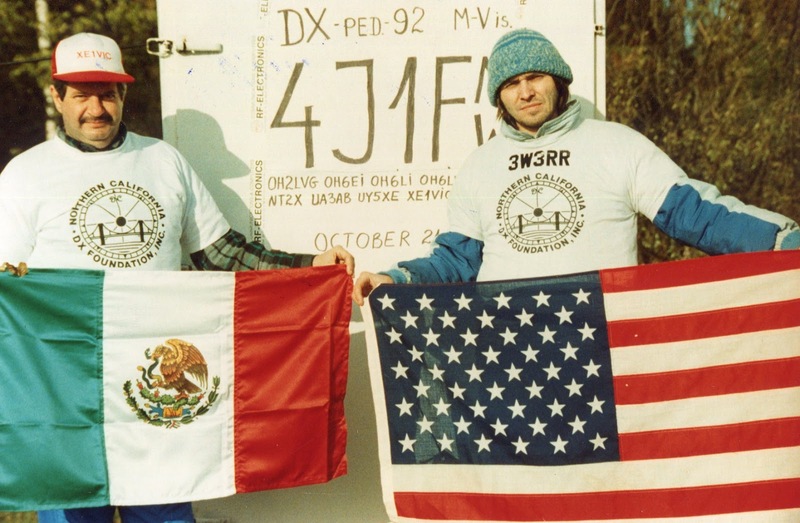 Being a multinational DXpedition, we worked and lived together, put up antennas, fought the quirks of propagation, suffered together the freezing weather, worked the pile-ups, joked, ate and toasted Ham Radio together. We learned about languages cultures and each other, shared contest and DX strategies, traded DX stories and on-the-air experiences. We even celebrated Romeo's birthday while we were on MV Island. When hams meet on the air we do the same things without seeing each other. This time was different. Face to face, this was Amateur Radio Live. This was our own 'mini-Dayton' with elements of CQ WW Contest and Field Day mixed in. What an unforgettable experience in the best ideals and traditions of our hobby! Should we do it again, sometime? We appreciate the assistance of the following groups and individuals: OHSNZ, WB2JZK, WB2ZHB, OH2BH, OH1VR, RW3AH, RC2AR/AA3BG, UA3AF, Mr. Vasilevsky (Saimaa Canal Commission), KZ3H, KA2DMQ, UW3AX, UT5JDA, UA1FA, OH8AA, OH6NVI, OH6MRA, N2KK, K8CH, Mr. Roman Bezfarmilny (USA), SRAL, INDEXA, NCDXF, RF Electronics of Finland. Special thanks to W8UVZ, W0CD and K8GG for providing the 'Battle Creek Special' antenna. The author wishes to express his gratitude to Frank Smith AA7FM, for assistance in editing this story.